On the 2nd of December 2011, I visited the Palace of Holyroodhouse in Edinburgh. 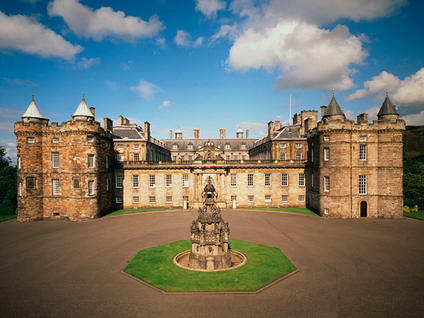 This is the official residence of the Queen when she comes to Scotland. It is situated at the end of the Royal Mile. We first entered the front court where we could see the different towers of the Palace. Then, we moved forward in the Palace itself. We took the stairs to the first floor and arrived in the room where Her Majesty the Queen receives people to dine. Further on we saw the different rooms used for official ceremonies. And with the audio guide we also had an account of the use of the rooms in the time of former kings or queens, such as Charles II and Queen Mary. The visit also allowed us to see jewels and objects that belong to the Royal Family. As we went on in the Palace we discovered portraits of different important people of Scotland on the walls, the official Robe of the Queen as a member of the Order of the Thistle and the old rooms of Queen Mary. We saw her bed and the little room where she used to dine. The visit ends with the ruins of the abbey of the Palace. I really liked to visit the Palace of Holyroodhouse because we saw things that belong to the British tradition and the Royal Family. In spite of the coldness of Edinburgh that day I did enjoy this visit. The audio guide was well-made so that we received all the information needed, comments of professionals of the Royal British tradition and even anecdotes. For example, the room where the Queen received the actor Sean Connery to give him a distinction. In one of the rooms we could see a video of pipers playing “God save the Queen” and other images of official ceremonies in the Palace. In conclusion, the palace of Holyroddhouse is definitely one of the most important things to see in Edinburgh.